Bonus Buys today at Kohl’s! 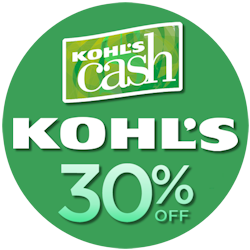 Kohl's cardholders can use code BASKET30 to save an extra 30% until the 20th and code APRMVCFREE for free shipping (in most areas). Non-cardholders can save 15% with coupon code USAVEMORE. Get free $10 in Kohl's Cash with every $50 spent after discounts until the 20th. Bonus Buys today at Kohl’s! Kohl's cardholders can use code FASHION30 to save an extra 30% until the 31st and code MARMVCFREE for free shipping (in most areas). Non-cardholders can save 15% with coupon code SPRINGTIME. Get free $10 in Kohl's Cash with every $50 spent after discounts until the 31st. 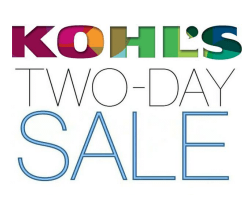 2-Day Specials today at Kohl’s! Kohl's cardholders can use code MARCH30 to save an extra 30% until the 6th and code MARMVCFREE1 for free shipping (in most areas). Get free $10 in Kohl's Cash with every $50 spent after discounts until the 10th. Bonus Buys today at Kohl’s! Kohl's cardholders can use code PINK30 to save an extra 30% until the 18th and code FEBMVCFREE for free shipping (in most areas). Non-cardholders can save 15% or 20% off $100 with coupon code FROZEN. Get free $10 in Kohl's Cash with every $50 spent after discounts until the 14th. Bonus Buys today at Kohl’s! Kohl's cardholders can use code MITTENS30 to save an extra 30% until the 27th and code FREEMVCJAN for free shipping (in most areas). Non-cardholders can save 15% or 20% off $100 with coupon code NEWYEAR. Get free $10 in Kohl's Cash with every $50 spent after discounts until the 21st. 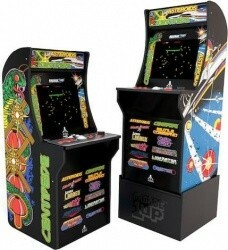 Kohl's has the highly rated Arcade 1Up 12-in-1 Retro Arcade Machine with Bonus Riser Stand for $349.99. This item also currently includes free shipping. You will also earn $75 in Kohl's Cash to use on a future purchase. 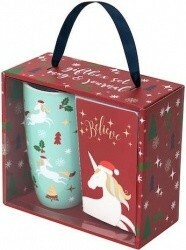 Kohl's has put together over 200 $10 & Under Stocking Stuffers for Kids. Save up to 70% off, plus take an extra 25% off your order with coupon code HOLIDAY25. Get free shipping on orders of only $50 or more or choose free store pickup. Deal ends Saturday night. Get ready to deck the halls! 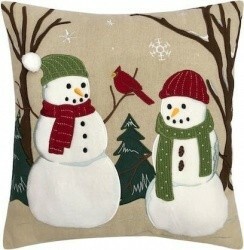 Kohl's has 50% off select St. Nicholas Square Trim-A-Tree Holiday Decor & More. Save on over 500 items including bed & bath, home decor, kitchen & dining and more. Plus take an extra 25% off your order with coupon code HOLIDAY25. You'll earn $10 in Kohl's Cash with every $50 spent (after discounts). Get free shipping on orders of only $25 or more or choose free store pickup. Sale ends Saturday night. Kohl's is having a huge Clearance Sale with up to 70% off thousands of items from every department, plus take an extra 25% off your order with coupon code HOLIDAY25. You'll earn $10 in Kohl's Cash with every $50 spent (after discounts). Get free shipping on orders of only $25 or more, or choose free store pickup. Sale ends Dec. 8th. 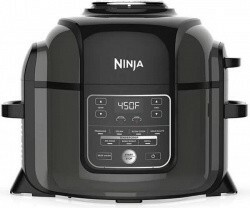 For Kohls Charge cardholders, Kohl's has the extremely popular Ninja Foodi Multi-Cooker for $160.99 after 30% off code APPLE30, $10 off $25 code VETERANS and $10 off $50 code NOVHOME10. 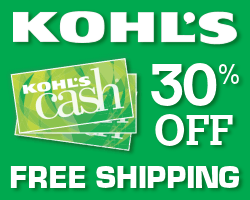 Free shipping is included and you'll earn $30 in Kohl's Cash. Big sale today at Kohl’s! Kohl's cardholders can use code APPLE30 to save an extra 30% until the 15th and code MVCFREENOV for free shipping (in most areas). Non-cardholders can save 15% with coupon code KICKOFF15. Stack with code NOVHOME10 for $10 off $50 on home items and get free $10 in Kohl's Cash with every $50 spent after discounts. 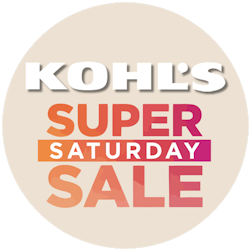 Kohl's has a big Super Saturday Sale happening today only. Look for their famous Early Bird specials available only until 4pm ET this afternoon. 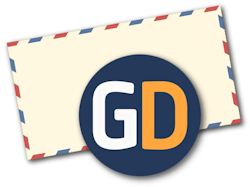 Use code GOSAVE20 to save 20% on your order and HOLIDAYHOST for another 15% off holiday essentials. Get $10 in Kohl's Cash with every $50 spent and free shipping is included with orders of $50 or more during this sale. Get Kohl’s Black Friday Deals Today with Extra 20% off & $15 Kohl's Cash! Ending soon! 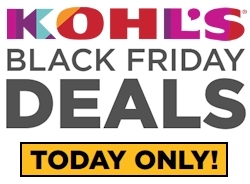 Kohl’s is celebrating the release of their Black Friday ad by offering many of their Black Friday deals today only on Kohls.com. 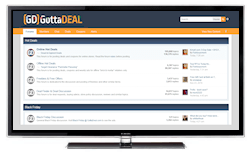 See those deals here. Also, you’ll save an extra 20% on your order today with coupon code GOSAVE20 and get free shipping on $50 or more. You’ll also earn $15 in Kohl’s Cash with every $50 spent today only. Kohl's is offering an extra 25% off Cold Weather Essentials for the Family including select boots, outerwear, sweaters, fleece bedding and more with coupon code LASTCHANCE. Get free shipping on orders of $75 or more or choose free store pickup. Offer ends Tuesday night. 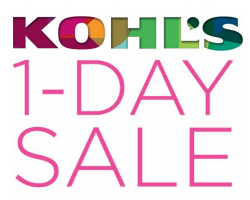 Today only, Kohl's is having a 1-Day Doorbusters Sale with up to 70% off over 160,000 items from across site. Take an extra 20% off with coupon code WAVES, then stack coupon code EXTRA for another $10 off $50 order - see site for details. You will also get $10 in Kohl's Cash with every $50 spent (after discounts). Get free shipping on orders of $75 or more or choose free store pickup. Yes2You members earn triple rewards points as well! Through Sunday night, Kohl's is having a 50% off Sale with 50% or more off over 9,000 items throughout the site. Take an extra 20% off with coupon code WAVES, then stack coupon code EXTRA for another $10 off $50 order - see site for details. You will also get $10 in Kohl's Cash with every $50 spent (after discounts). Get free shipping on orders of $75 or more or choose free store pickup. Yes2You members earn triple rewards points as well! Kohl's has up to 70% off thousands of items in their Gold Star Clearance Sale, plus take an extra 20% off with coupon code WAVES. And, you’ll get $10 in Kohl's Cash with every $50 spent. You will also get free shipping on orders of $75 or more, or choose free store pickup. Sale ends Sunday night. Kohl's has a big One Day Only Sale today. First, use code WAVES to save an extra 20% off most items. Today only, stack with code SHOE20 to save another 20% on shoes and boots for men and women. You'll also get $10 in Kohl's Cash with every $50 spent after discounts. Also, free shipping is included on orders of $75 or more. Kohl's is having a huge Fall for Great Saving Sale with up to 70% off over 90,000 items from across the site, plus, take an extra 20% off with coupon code WAVES. And, you’ll get $10 in Kohl's Cash with every $50 spent. You will also get free shipping on orders of $75 or more, or choose free store pickup. Sale ends Sunday night. Bonus Buys today at Kohl’s! Kohl's Charge cardholders can use code HARVEST30 to save an extra 30% until the 21st and code MVCFREEOCT for free shipping with no minimum (in most areas). Non-cardholders can use code OCTSAVE for 15% off or 20% off $100. 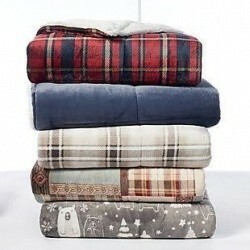 Stack with $10 off $50 in men's or home departments - codes posted on Kohls.com. Everyone gets free $10 in Kohl's Cash with every $50 spent. Today only, Kohl's is offering up to 70% off thousands of Gold Star Clearance Items, plus take an extra 20% off sitewide with coupon code CORNMAZE20. Get free shipping on orders of $75 or more, or choose free store pickup. Kohl's is having a Flash Sale and offering an extra 20% off sitewide even on clearance items already marked down to up to 70% off with coupon code CORNMAZE20. Get free shipping on orders of $75 or more, or choose free store pickup. Sale ends Wednesday night. Today only, stack the codes at Kohl's and save big during this final day of their Friends & Family Sale. Take $10 off $50 with code TENOFF, then get 20% off your order by stacking code FOREVER, and if you are buying home items take another 20% off with code REFRESH20. You'll earn $10 in Kohl's Cash with every $50 spent (after discounts). Get free shipping on orders of $75 or more. Through Monday night, Kohl's is having a Home Sale with saving on select furniture, bedding, decor, window treatments, storage items and rugs, plus, take an extra 20% off these items with coupon code REFRESH20, then get another 20% off your order by stacking coupon code FOREVER. You'll earn $10 in Kohl's Cash with every $50 spent (after discounts). Get free shipping on orders of $75 or more, or choose free store pickup. 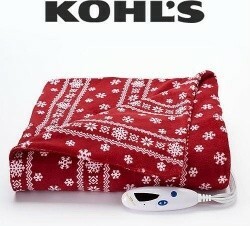 Through Monday night, Kohl's offers their popular St. Nicholas Square Print Fleece Throw in 7 pattern choices for $3.19 when you stack coupon code REFRESH20 and coupon code FOREVER. You'll earn $10 in Kohl's Cash with every $50 spent (after discounts). Get free shipping on orders of $75 or more, or choose free store pickup. Kohl's has up to 70% off thousands of items from across the site in their Gold Star Clearance Sale, plus take an extra 20% off your order with coupon code FOREVER. You'll earn $10 in Kohl's Cash with every $50 spent (after discounts). Get free shipping on orders of $75 or more, or choose free store pickup. Offers end Monday night. 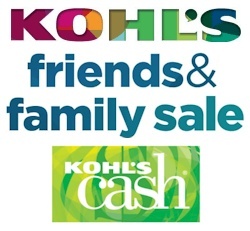 Kohl's is having a huge Friends & Family Sale with up to 70% off over 150,000 items from all departments, plus, take an extra 20% off your order with coupon code FOREVER. You'll earn $10 in Kohl's Cash with every $50 spent (after discounts). Get free shipping on orders of $75 or more, or choose free store pickup. Sale ends Monday night. 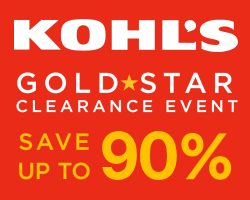 Today only, Kohl's has up to 70% off 1,000s of Gold Star Clearance Items, plus take an extra 20% off sitewide with coupon code HURRY20. Get free shipping on orders of $75 or more, or choose free store pickup. Kohl's is having a Flash Sale and offering an extra 20% off sitewide, including sale and clearance items with coupon code HURRY20. Get free shipping on orders of $75 or more, or choose free store pickup. Sale ends Wednesday night. 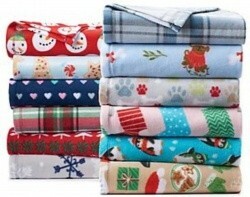 Kohl's is offering the highly-rated Cuddl Duds Cozy Soft Throw in your choice of 10 patterns for $24.99 each. And, you will get free $5 in Kohl's Cash with every $25 spent. Get free shipping on orders of $75 or more, or choose free store pickup. Deal ends Sunday night. 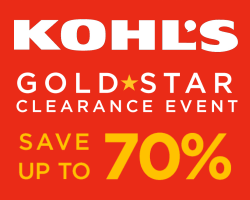 Kohl's is having a huge Gold Star Clearance Sale with up to 70% off thousands of items from all departments. And, you will get free $5 in Kohl's Cash with every $25 spent. Get free shipping on orders of $75 or more, or choose free store pickup. Sale ends Sunday night. Kohl's is having a $5 & Under Sale with hundreds of items from across the site. Prices start at only $1.99. And, you will get free $5 in Kohl's Cash with every $25 spent. Get free shipping on orders of $75 or more, or choose free store pickup. Sale ends Sunday night. It only happens twice a year, and it's here! Kohl's is having their Lowest Prices of the Season Sale with up to 75% off over 36,000 items from across the site. Price so low, no coupons are needed! And, you will get free $5 in Kohl's Cash with every $25 spent. Get free shipping on orders of $75 or more, or choose free store pickup. Offer ends Sunday night. New deals at Kohl’s! Kohl's Charge cardholders can use code CRISP30 to save an extra 30% until the 23rd and code FALL4MVC for free shipping with no minimum. Non-cardholders can use code BUYNSAVE for 15% off or 20% off $100. 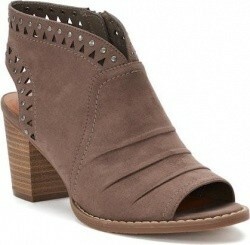 Stack with $10 off $50 in men's or women's departments - codes posted on Kohls.com. Everyone gets free $10 in Kohl's Cash with every $50 spent. Kohl's has up to 70% off thousands of Gold Star Clearance Items from all departments, plus take an extra 20% off sitewide with coupon code USAVE20. You will also get free shipping on orders of $75 or more, or choose free store pickup. Offer ends Wednesday night. Kohl's is having a Flash Sale and offering an extra 20% off sitewide, including sale and clearance items with coupon code USAVE20. Some exclusions may apply, see site for details. You will also get free shipping on orders of $75 or more, or choose free store pickup. Sale ends Wednesday night. Kohl's is having a $25 & Under Clearance Sale with up to 90% off over 9,000 items from all departments. Everything is under $25 with prices starting t only $1.19. You'll earn $10 in Kohl's Cash with every $50 spent (after discounts). You will also get free shipping on orders of $75 or more, or choose free store pickup. Sale ends Sunday night.